I'm suffering from a serious Christmas hangover. I want to sleep until it's 2008. I've traveled too much, eaten too much, I even got too many gifts. I'm pretty sure I wouldn't manage to get back home without my dear husband. My bag is just too heavy for me. These travel tissue pockets were given to my mom and a girl friend. Mom got the one with buttons. 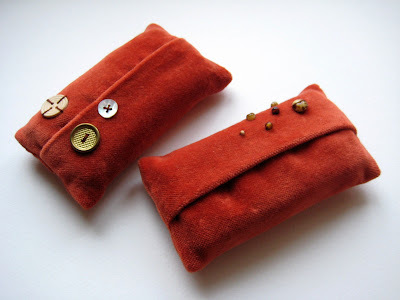 I made these from the velvet leftovers of the fox and lined them with soft brown cotton.Right now I'm trying to stay as far away from the cat of my in-laws as I can. I have difficulties focusing on life. Hyvää Joulua! Merry Christmas to everyone! I've had a rather sleepy but nice Christmas day so far. Flu is almost gone! In Finland we exchange gifts on Christmas eve and therefore it's now safe to blog about my handmade gifts. These little pouches were given to my friends and my brother's girlfriend. 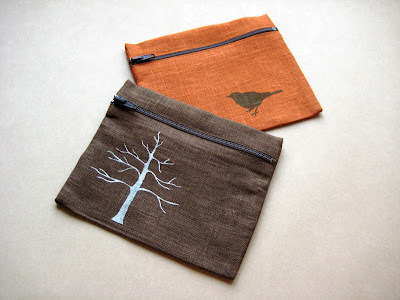 I made two orange pouches with a little birdy and one brown with a tree. 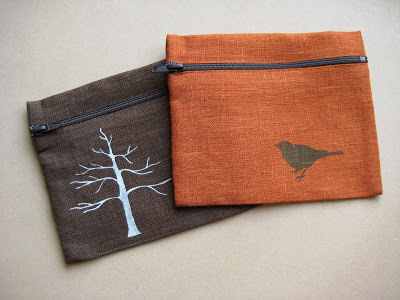 Linen pouches are lined with very soft brown cotton, hand stenciled with fabric paint. Approx. 18x17cm. I'd like to thank you all for your kindness, your comments and endless inspiration! Blogging has been a most wonderful experience so far, and I'm certainly going to carry on with this! Thank you again! May your holidays be peaceful and filled with kind thoughts! Thanks for all your get well -wishes! I'm definitely getting better, but the cough is still alive and kicking. I'll spare you from the details. I was inspired by all the spoons over at Skinny laMinx's blog, and of course also by her print Borrowed spoons. We have spoons too, but I like scissors. A lot. 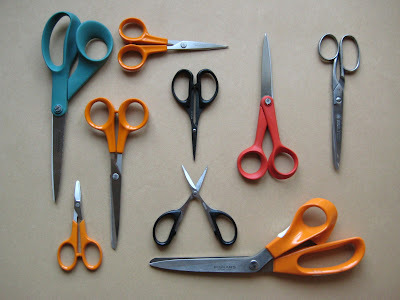 I think I could never have too many scissors. I don't know why would I need any more, but cutting is fun = new scissors are fun. Most of you will recognize that Fiskars orange, but also the teal and red ones are made by Fiskars. The red ones are for left handed. It took almost a decade to convince my Mom about it. Those were my first proper scissors, and they were just fine even though I'm right handed. The black ones are teflon coated. That's nice. I don't know if there's any difference to the similar non-coated scissors when it comes to cutting, but knowing that the teflon is there makes me feel better. What a scissor snob! Tomorrow we're off to my home home, which is my parents' house, and from there we'll go to my husband's parents. We won't be back to Turku until next year. I'll keep updating even though I'm on the road. I don't want you to feel abandoned any more than you already feel. I'm very happy that I managed to get tickets for a very special gig in April. Einstürzende Neubauten is playing at Tavastia, Helsinki. It's their first gig in Finland since 1984 (that's when I was born) and I'm going there with my husband and Milla. I'm usually quite sensitive when it comes to noise, but this gig is something I'm not planning to miss. I hope I've recovered from my flu before it's April.